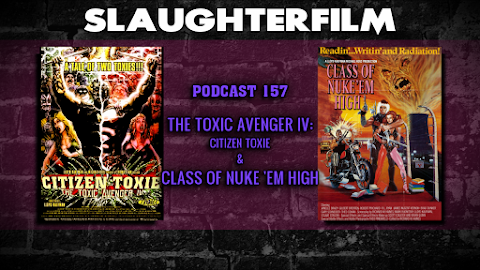 This week Forest brings an end to "the Summer of Toxie" with The Toxic Avenger 4: Citizen Toxie. Cory joins Forest with a Troma flick of his own, The Class of Nuke 'Em High. The Horror Duo also chat about Jurassic World, and Forest shares his thought on the films shortcomings. Cory explains why he enjoyed the WWE's John Cena during the recent Money in the Back PPV. Also, bourbon was involved and Cory ordered some of J.R.'s Family Bar-B-Q -- Mmmmm. All this and what is perplexing about the new Terminator Genisys trailer and trailers in general -- they confuse the elderly, don't cha know? For more Slaughter Film news and reviews, as well as show notes and special events, make sure to visit our website; SlaughterFilm.com.